We think Louis has formed a truce with a local squirrel. Normally he kicks off if he sees a squibble in the back garden but he’s allowed one access to a fatball that was housed in an anti-squibble cage and hung out for the birds. So…first thing this morning when he was let out to ruin the grass and pick up mud for depositing on the carpet he raced over to the tree and hoovered the fatball before Sue could see what he was up to. Memories of the time we fed him two ducks (It shouldn’t happen to a vet) came flooding back so we are keeping an eye on him. He was also a bad lad on Boxing Day. Whilst we were making soup out of the turkey leftovers he managed to pilfer some of the turkey bones – something we have been very mindful of keeping him away from over the years. He’s also started to graze kitchen worktops and tables if you are not in the room so we need to try and get him out of that habit. Anyway – we never have a camera ready to catch him up to his tricks but we can always catch him doing his second most favourite hobby – kipping. Here he is enjoying the new fire. It looks as though the fire guard is getting in the way of Louis actually climbing into the fire. Thanks for dropping by. Yes, Louis is a bit of a pyromaniac. Last night we had to move him away from the fire as he was starting to roast. 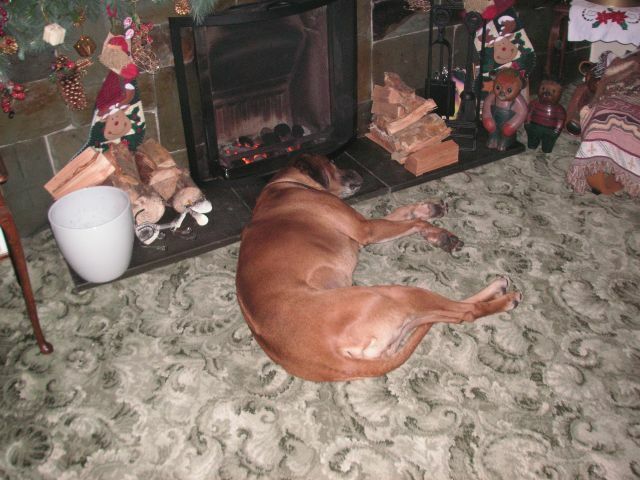 We had a “Living Flame” gas fire in our last home and Louis never bothered with that even in the depths of our English winters. However, from the moment we got this real fire going in our new home, Louis decided that there should be an exclusion zone around it and he’s the only one allowed in it. Can’t email you what’s happening ? Have you a new email address ?